The exploits of John Dee in Prague cast long shadows over the history of Central European alchemy. Colorful tales of the English alchemist dominate both popular and scholarly legend, yielding countless stories and studies. Recent works on Polish and Hungarian noblemen alchemists have only begun to pull back the curtains to reveal activities outside the imperial capital. As I will show, a pair of sixteenth-century notebooks can illuminate this darkness. 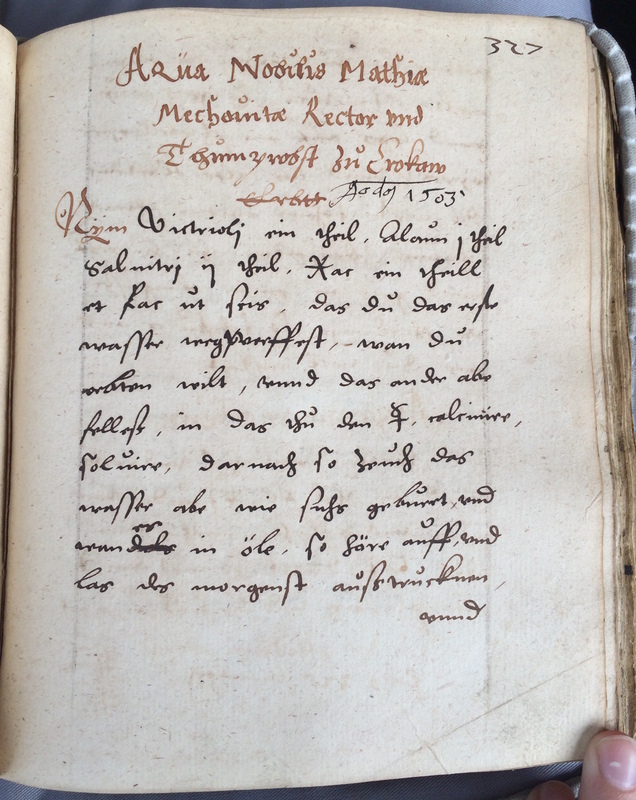 The notebooks, now held at the Leiden University Library, collect recipes from throughout Central and Eastern Europe and are the work of the Silesian humanist Franciszek Mymer (c.1500-c.1570) and his sons, Franz, Adam, and Georg. The Mymer family found fellow practitioners as close by as the next village or as far away as Riga. They almost never sought recipes from Prague. The Mymer collections complicate the geography of alchemy in Central Europe, shifting the landscape from a single famous center to multiple, more everyday centers. If we map the points of origin given for these recipes, the picture that emerges is one that pushes the boundaries of our understanding of the sixteenth-century alchemical market. 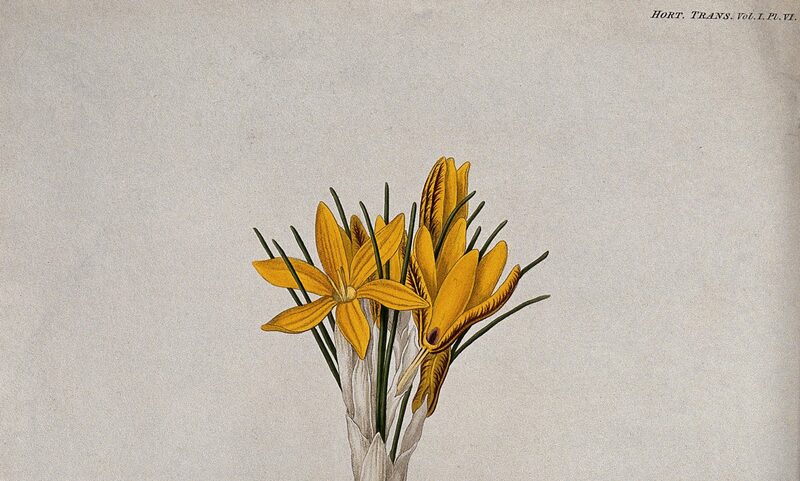 While alchemical recipes make frequent appearances on this blog, it’s almost always in a western European context (see the discussions of English, Dutch, and German alchemists). In this post I will look at alchemical activity on the other end of the continent where the Mymer family pursued their art. Over the course of their lives, Franciszek Mymer and his sons moved and travelled all over Central and Eastern Europe. Born in Lower Silesia, Franciszek went south to Cracow around 1519. He studied at the university there for a time and found work as a printer, translator, and poet. During his two decades in Cracow, Franciszek developed an interest in alchemy during this time. In 1540 or 1542, Franciszek left the Polish royal city and moved north, passing several years in Thorn (now Toruń), the town that had produced Copernicus a generation earlier. His first son, Franz, was born around this time. Franciszek made a final move to Dohna, near Dresden, where he served as a Lutheran pastor until his death around 1570. Franz followed his father’s religious calling and attended the Lutheran university in Wittenberg. He settled in Saxony for a time before moving to Moravia, near Olomouc. Of the two younger Mymer boys, Adam remained in Saxony, while Georg eventually returned Silesia and worked as a goldsmith in Breslau (now Wrocław). The Leiden manuscripts – Vossiani Chymici Q29 and F19 – were a family effort, put together at various stages on their journeys across Central Europe. The Mymers were unusually careful in recording the supposed authors of each recipe – perhaps as a means of establishing authority, as was done with medical recipes at the time. The family collected widely: their recipes are attributed to priests, monks, cathedral provosts, doctors, goldsmiths, a nailmaker, a chef, and an unexpected number of Teutonic Knights. Some of these attributions are more fiction than fact. Many others, though, are accurate and testify to the Mymers’ wide-reaching network of alchemical friends and acquaintances. 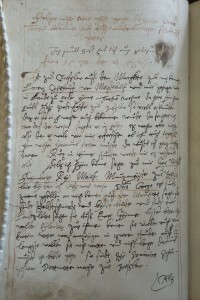 Beginning of Georg’s account of his recipe hunt in Breslau, 21 August 1570. Leiden University Library, Vossiani Chymici F19, f.81v. Franciszek’s long stay in Cracow yielded a number of recipes by Maciej of Miechów (a.k.a. Miechowita, 1457-1523), the famous doctor and professor of medicine at the University of Cracow. Alongside the more usual recipes for producing silver or extracting gold from mercury, Maciej explains how to make gold from two varieties of catnip(!). Franciszek’s sons strayed further afield. Adam and Franz both got a number of recipes from Martin Eyser, a draper in Glatz (now Kłodzko in southwestern Poland). Franz visited a Breslau surgeon and follower of Paracelsus named Johannes Scholz in Riga in 1579. Georg is particularly wordy in describing the lengths he went to in pursuit of recipes. Most often, his stories start in the market square of Breslau. On 21 August 1570, for example, a friend from Madgeburg told him of a famous recipe in the hands of an unnamed Polish voivode (perhaps Olbracht Łaski, Palatine of Sieradz). According to Georg, acquiring this recipe took the help of no less than three goldsmiths, one imperial official, and one piper. 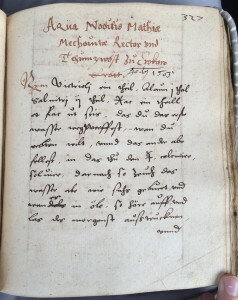 And just in case you might doubt him, Georg had one of the participants confirm the story by writing his name in the manuscript at the head of the story. Maciej of Miechów, how to turn catnip into gold. Leiden University Library, Vossiani Chymici Q29, f.327r. The Mymers looked far and wide for their recipes. They collected across a wide swath of Central and Eastern Europe, from Nuremburg to Vilnius and Riga, and a number of cities and towns in between. The Mymers chose to look east for their recipes and found alchemists there ready to supply them. This rich tapestry of alchemical practice is just waiting to be uncovered. I am grateful to Anna-Maria Balbach, Center for Language Study, Yale University, for her assistance with the early modern German. 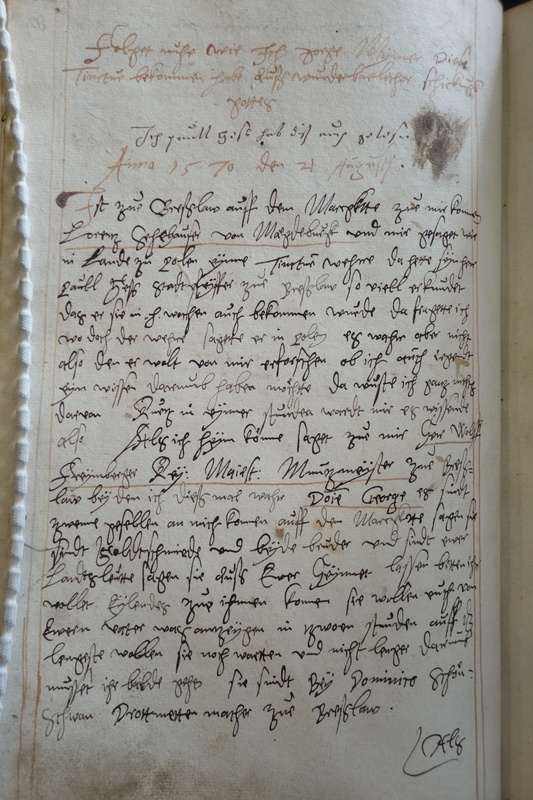 The archival trip behind this project was made possible by a SHAC New Scholars Award and a Scaliger Fellowship from the Leiden University Library. Agnieszka Rec is completing a doctorate in Medieval History at Yale University. Her thesis, titled “Transmutation in a Golden Age: Reading Alchemy in Late Medieval and Early Modern Cracow,” uses the biography of an alchemical miscellany to reconstruct the community of practitioners in Cracow and their ties to wider European traditions of alchemy. An article based on this research appeared recently in Preternature. Previous PostPrevious Controlled substances in Roman law and pharmacy?